This week’s episode of WWE SmackDown aired live from Greenville, South Carolina at the Bon Secours Wellness Arena. In addition to the takeaways below, WWE also aired three videos breaking down the long rivalry between The Miz and Daniel Bryan. Below is one of the videos and the remaining two will likely be uploaded to WWE’s YouTube channel shortly. Charlotte Flair, Becky Lynch, and SmackDown Women’s Champion Carmella kicked off this week’s episode of SmackDown. Carmella claimed that it was absurd that SmackDown GM Paige forced her to come down to the ring tonight with Lynch and Flair. She claimed that she was tired of their faces and tired of constantly being punished for being an “amazing” champion. Carmella poked fun at Becky Lynch and claimed that she doesn’t have a chance in the match now. Becky said that she was losing sleep thinking about beating Carmella one versus one at SummerSlam. Lynch added that now she also has to go through Charlotte at SummerSlam. Carmella laughed and then boasted about beating Charlotte Flair twice and then stated that Becky was only the first SmackDown Women’s Champion because Charlotte was on RAW. Flair said that Carmella knows she cannot hang with anyone in this division and has to cheat to win. Charlotte added that Carmella is a “diva living in a women’s era”. Carmella said that she is a diva and she is damn proud of it. Carmella then told Flair and Lynch that she had a better body and charisma than them. She then raised the title in their faces before SmackDown GM Paige interrupted. Paige said she knows that they will steal the show on Sunday but it is also her job to make SmackDown the best show possible. Paige told Carmella to join commentary as Lynch and Flair battled Mandy Rose and Sonya Deville in a tag team match. Deville and Charlotte started off the match as Carmella accused Paige of being jealous of her because she will never be champion again. Charlotte connected with a couple of chops in the corner and then tagged in Becky. Lynch connected with a Leg Drop for a two count. Mandy Rose tagged in and hit Becky with a Dropkick. Becky responded with a Dropkick of her own and tagged Flair back into the match. Mandy pulled Charlotte to the mat by her hair and tagged Sonya Deville. 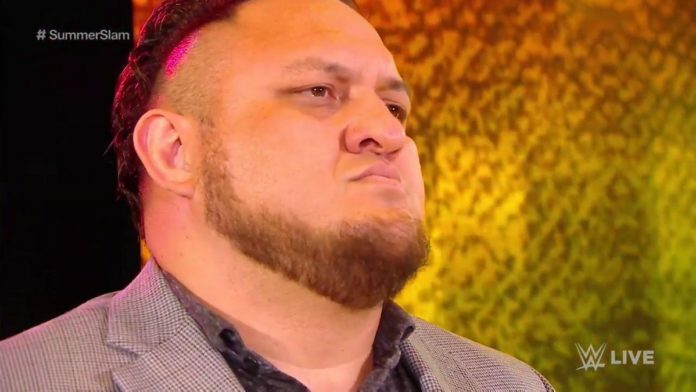 Sonya missed with a kick and Charlotte connected with a Fallaway Slam that sent Sonya out of the ring. Becky tagged in and connected with a flying forearm outside the ring. Back in the ring, Charlotte was back in and Deville brought her to the corner of the ring. Rose tagged in and beat her down before quickly tagging Sonya back in. Rose tagged back in as Charlotte rolled up Deville and kneed Flair in the face as SmackDown went to a commercial break. When SmackDown returned, Becky was trapped in the corner as Rose shoved her face into the ropes. Lynch went for an Exploder Suplex but Rose countered into a Body Slam and tagged Deville back in. Sonya applied a Headlock and brought Lynch down to the canvas as Charlotte pleaded for a tag on the apron. Lynch battled out of the hold and connected with an Enziguri that knocked Deville to the mat. Rose tagged in and Becky greeted her with two Clotheslines and a Dropkick. Becky connected with the Exploder Suplex this time and then a forearm to the face. Lynch then knocked Deville out of the ring and locked in the Dis-Arm-Her on Mandy Rose for the submission victory. Carmella posed on the announce table with the SmackDown Women’s Championship and trash talked with Lynch and Flair following the match. Flair and Lynch then had a conversation backstage after the match. 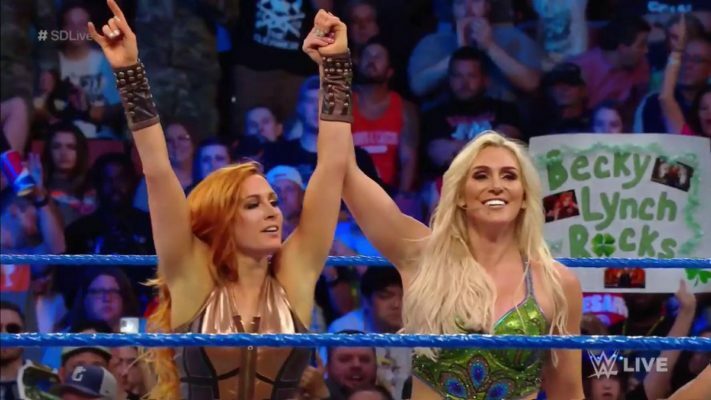 Flair wished Becky good luck and Lynch stated that she doesn’t need luck.